While Brett Kavanaugh was lying about beer and boofing, I wrote a song. For my daughter, for my niece, because they deserve to inherit a better country than the one we’re handing them. What’s my face look like while getting slapped? Save “Straight White Male” on Spotify to find out today. While Brett Kavanaugh was lying about beer and boofing, I wrote a song. For my daughter, for my niece, for their friends. Because they deserve to inherit a better country than the one we’re handing them. 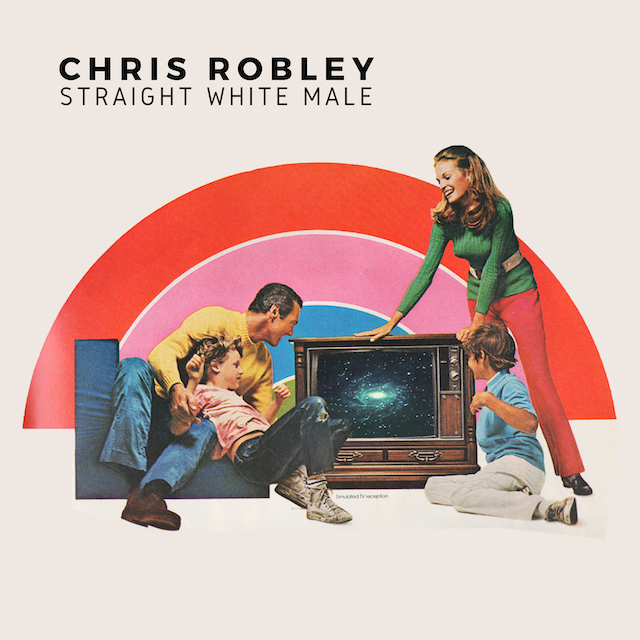 “Straight White Male” is an electro-leaning pop song with hypnotic beats and bits of seething psychedelia underneath, in which Chris Robley files a toxicology report on American middle-class masculinity. Composed during the confirmation hearings for Supreme Court Justice Brett Kavanaugh. Doctor Christine Blasey Ford was questioned by a female prosecutor hired by Republicans because they were nervous about the optics of an all-male panel interrogating an alleged sexual assault victim. Some people ( I’ve seen their texts ) think that Feminism’s aim is to sap the “God-given strength and vitality” of men. Women comprise roughly 20% of The United States Congress. You can tell what a town’s priorities are by what they build the biggest. Cathedral? Bank? Corporate HQ? Sports arena? When I showed up for college in Richmond, Virginia as an 18-year-old Yankee, I drove down Monument Avenue dazzled by the size and significance of these statues : Robert E. Lee, J.E.B. Stuart, Jefferson Davis, Stonewall Jackson, Matthew Fontaine Maury. Silent and menacing. Heroes of the Confederacy. Each their own sentence in the story of the Lost Cause. No dead myth. A way of life. The statues are still standing. Did I realize any of this then? No. I’m a white guy. And whatever whiteness means, it means the tentacles of the Lost Cause could reach far north into the imagination of a little white kid who thought the past was in the past. Believed that there could be anything noble or gentile about defending Slavery. Believed a thousand bad and broken things. Believed that believing those things wasn’t Racism. Oh, and look over there! It’s Arthur Ashe! A cricket’s wings serve as a protective shield for the soft parts of its body. In males, these wings have rough teeth-like ridges which, when scraped together, make the chirping sound we associate with the entire species. Be the first of your friends to board the Oculus Raft or upgrade to the latest MePhone and you’re an “Early Adopter.” Be the first of your family to notice and define a sickness, you’re an infiltrator, a killjoy. You can observe the conditions of experience for a whole lifetime and never notice them. But rip the fabric of our fantasy just a little bit and the whole mind recoils. For every $100 in white family wealth today, black families hold just $5.04. “Redlining” is/was the federal housing policy of giving loans to people who live in “good” neighborhoods; giving no loans to people who live in “bad” neighborhoods. Thus between 1934 and 1962, 98% of home mortgages went to white families. In real estate, the Middle Class dream of being left alone. I was watching Brett Kavanaugh cry and yell and lie. About boofing. About beer. And I thought, my daughter, my niece, their friends — they will not inherit the country they deserve. It’s a cliche to say we’re ruled from all angles by old white men. But often cliches are tired because they’re true. You see Lindsey Graham, Orrin Hatch, Chuck Grassley, even Goldemort-On-High, say that Blasey Ford is “credible,” yet do NOTHING to give credit to her testimony. Dante would’ve put them in a poem. But think of their shrunken souls, their fear, the prison of needing to keep what’s in their hands. It’s not Feminism or Racial Justice that’s sapping their vitality. It’s the performance of being Straight White Males. They don’t need Dante. They’re already in hell. It’s a hell they mete out through a megaphone upon everyone who isn’t straight, or white, or male. And sometimes on their own demographic too. But of course it doesn’t have to stay that way. you can’t tell what’s the woods and what’s your lawn. ‘cause the measure, measure, measure of a real man’s in his hands? Ain’t that right, white American man? but when the house falls asleep you unplug that wire. Leave it on too long you know it’ll start a fire. the only thing you understand’s the only thing you understand. but you better bail a leaky boat and never lose sight of land. and somewhere across town, lights are coming on. Cover image designed by Tony Altamirano. Written, performed, and recorded by Chris Robley at Bite My Tongue in Lewiston, Maine. Mixed by Peter Rodocker at Yellow Room Recording in Portland, Oregon. In between is a whole continent. Imagine that!